Dr Pahor Labib باهور لبيب was a renowned Egyptologist and Coptologist. He was the Director of the Coptic Museum, Old Cairo, from 1951 to his retirement in 1965. He was heavily involved with the translations of the Nag Hammadi Gnostic Papyri. He was the son of the renowned Coptologist Cladius Bey Labib, author of the extensive Coptic-Arabic dictionary and teacher of the Coptic language in the Theological College at Cairo. Cladius was the second Egyptian to learn Hieroglyphs, after the famous Ahmad Kamal. His son Pahor was the first Egyptian to obtain a Ph.D. in Egyptology, in 1934. The Copts are the descendents of the ancient Egyptians, and they constitute between 10-15% of the Egyptian population. It is an official policy of the authorities in Egypt not to announce the number and percentage of the Copts after the army officers' coup of 1952. The vast majority of the Copts belongs to the Coptic Orthodox Church, a member of the Eastern (Oriental) Orthodox Churches that also includes the Syrian, Armenian and the Ethiopian churches. They acknowledge the first three ecumenical councils, namely those of Nicea (325 AD), Constantinople (381 AD), and Ephesus (431 AD), but not that of Chalcedon (451 AD). This is the fourth and last version of the Ancient Egyptian language; the earlier ones are the Hieroglyph, Hieratic, and Demotic. It borrowed the Greek alphabet and added seven from the demotic that had no corresponding phonetics in Greek. It was the dominant language in Egypt well after the Arab invasion of the country in 641 AD. The Coptic language was brutally suppressed but was and still is being used in the liturgical services of the Coptic Church. One of the missions of Cladius Labib was to resurrect and popularise Coptic as a living language. For this aim he produced books for teaching Coptic and insisted that Coptic would be the language of everyday use at his home in Ain Shams, a suburb of Cairo. Thus Pahor grow up speaking Coptic fluently. He entered the Higher Coptic School in Cairo and used to excel in Coptic and receive prizes. When his father passed away suddenly, Pahor was not yet 14 years old; the young Pahor thanked those attending the church funeral service in Coptic. He joined Ghaddevia Secondary School, the most renowned in the country at that time. When he graduated, he joined both the Faculty of Law and that of Archeology. He used to pass the year-end exams in both. The final exams of both faculties were at the same time so he choose to sit that of Archeology. He graduated with honours and was sent to Germany to study for his Ph.D. degree. Pahor's father, Cladius, was a good friend of Pope Cyril V. Cladius accompanied the Pope on his tour in Upper Egypt on his way to attend the opening ceremony of the Aswan Dam in 1903. The Pope also visited Cladius at his home in Ain Shams. It was through the recommendation of the Pope that Cladius obtained his "Bey" from the Ghedevie. Pahor was one of the few who were allowed to visit and be received by the Pope when the latter was confined to bed at the end of his life. The Pope advised young Pahor to follow in his father's footsteps. Whilst studying in Germany, Pahor used to travel via Italy to visit his home land Egypt. In one of these visits, he had a personal audience with Pope Pius XII who gave him a massage to the Patriarch of Alexandria, Youanis IXX. Pahor's father, Cladius Labib, was the Coptic language teacher of Patriarch Youab II when the latter was studying in the Theology School. Pahor used to visit the Patriarch and both used to engage in a conversation in Coptic. Cladius Labib was moved from his resting place to a new burial site for the Coptic Orthodox and the Patriarch paid for the construction of the new family tomb. 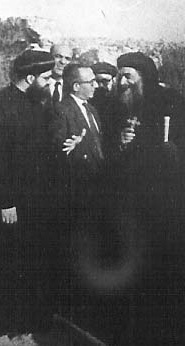 Pahor knew Pope Cyril VI when he was Father Mina before ascending to the throne of St Mark. Pope Cyril suggested to Pahor, the director of the Coptic Museum, to start excavations at Mari Mina site west of Alexandria. Pope Cyril chose Pahor to be a member of a committee that was given the task to present a new Arabic translation of the Holy Bible. This committee translated the four Gospels. The Pope also appointed Pahor head of a committee charged with locating and excavating the ancient St Mary's Cathedral at Tel Atrib. St Mina is a Coptic saint who was martyred in the fourth century. A great Cathedral was erected at his burial site in Maryout in the western desert of Egypt west from Alexandria. Many faithful from all round the Mediterranian used to visit the site and a flourishing community was in that area for centuries till the Arab invasion of Egypt when the Arabs destroyed the church. A German archeologist, Kuffman, carried out excavations at the site at the beginning of the 20th century, starting in 1905. Pahor resumed these excavations in 1951. The site then was in the middle of the desert and was difficult to reach. Pope Cyril VI founded a monastery near the site and this monastery is one of the main surviving monasteries in Egypt. There are now roads up to the monastery and the area has many cultivated fields. A great Cathedral named after St Mary was constructed in Tel Atrib near the city of Benha in the Delta, Lower Egypt. There are many records of the magnificence of this Cathedral such as that the capitals of the marble pillars were covered with gold. This Cathedral was destroyed by the Arabs during their invasion of Egypt. Pope Cyril VI and also Pope Shenouda III were keen for the area to be excavated. Excavations went on for years with the help of a Polish excavation group from the University of Warsaw. Locals encouraged by officials took over the area and covered the site that is used now for agriculture. Dr Labib used to teach at the Archeology institute and Pope Shenouda, before being ordained, attended Pahor’s lectures for one year. Pope Shenouda appointed Pahor to the committee that was investigating the relics of St John the Baptist in St Makarious Monastery in Nitria. The Coptic Museum houses the greatest collection of Coptic antiquities in the world. Dr Labib managed to turn the Coptic Museum into a Mecca for Coptic studies. A great momentum that helped in this direction was the formation of an international committee of the most renowned Coptologists in the world to translate and study the Nag Hammadi Coptic Gnostic Papyri. This library is considered one of the two major discoveries in the 20th century that contributed to Biblical studies, the other being the Dead Sea Scrolls. A government committee for promoting Christian pilgrimage was established during Naser’s time. This committee was chaired by Bishop Samuel and Dr Pahor Labib was a member. During this period stamps showing Chrisitan sites such as St Mary’s Tree at Mattaryya where it is reputed that the holy Family rested during their travels in Egypt‎. Other stamps of Christian sites and Coptic exhibits were issued. This page was last edited on November 30, 2009, at 22:24. This page has been accessed 24,339 times.